Last week, The Record reported that the city has secured funds to complete a streetscape project along Downtown’s Weber Avenue. As you’ve probably noticed, East Weber Avenue is currently only enhanced up to Stanislaus street. After this block, the pedestrian experience becomes rather uninviting. However, newly procured Transportation Enhancement grant money will allow the city to complete Weber Avenue’s transformation all the way to Cabral Station, improving a blighted string of blocks without tapping into the general fund. The Weber Ave plan includes trees, a landscaped median, and sidewalk reconstruction. Also, the plan calls for traffic calming measures, reducing the three-block stretch of Weber from two lanes each way to one. The plan will connect Cabral Station with the rest of downtown, giving station patrons better access to downtown amenities to the west. The Stockton monument sign on the corner of Weber and Stanislaus will also be moved to the east end of the project. City officials are hopeful that a contract can be selected in the winter with construction beginning next spring. Almassy also noted that the city was careful to maintain as many parking spaces as possible, a main concern of area business owners. To secure the funds, the city teamed up with the SJ Council of Governments. While the city applied for the grant, Almassy credits collaboration with SJCOG for helping the project move forward. The design was done by Stockton based Siegfried Engineering whose had a hand in several Stockton projects, including Dean DeCarli Square, Weber Point and the SJRTD transit hub. To be sure, there is nothing too grand about these plans. No separate bike lanes or public art appear to be included in the design, but this is still an important step in downtown’s revitalization, especially since it’s being funded through grant money. To most, these improvements appear to be modest. Sure, more trees and better sidewalks are great, but how does this actually help revitalize downtown? This is an appropriate question. 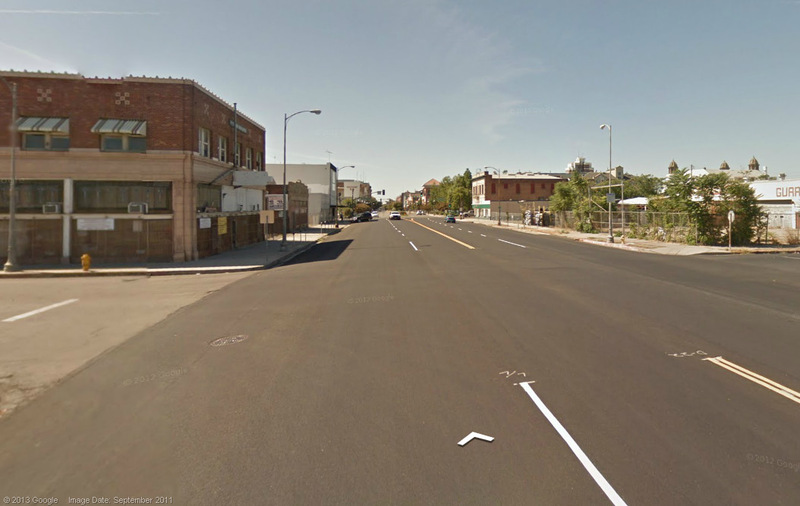 In its current state, this intersection at Weber Avenue and Grant Street is desolate. New federal funding will change that. These kinds of improvements do more than just make the sidewalks nicer; In other cities, these types of improvements help to entice private investment to the surrounding areas. In Downtown Lancaster, California, traffic calming and pedestrian improvements are credited with bringing in $125 million in private investment, resulting in a 26% increase in sales tax revenue. The project cost Lancaster a little under $11 million, quite the return on investment. The same thing happened in Mountain View where the redesign of downtown streets provided the necessary environment for $150 million in private investment in residential, retail and commercial projects. To be sure, nicer streets don’t by themselves translate into millions in private investment, but they are an important part of creating an inviting environment where people actually want to be. Potential business owners are less likely to open a store if the roads and sidewalks fronting the properties are unpleasant. In Stockton, even these relatively small costs of streetscape improvements are not a priority given our current budget realities. Fortunately, these projects can be funded through grants from state and federal programs, leaving general funds untouched. From TIGER grants to EPA funds, there is a lot of public money out there that the city can leverage to help create a better downtown. I’m so glad to see this. It’s really smart and timely in anticipation of the coming Ca High Speed Rail which will have the Stockton Station located at the ACE/Union Pacific Cabral Station at the east end of Miner Avenue at Aurora Street, whether they use this current station exclusively, or expand it for the anticipated future commuter capacity with a beautifully conjoined and integrated adjacent annex. So clearly one can see the strategy that Miner Avenue will become the “EAST GATE” of Downtown Stockton in which the Miner Corridor will become a major artery of great urban activity. This Miner Corridor can also be “branded” and “marketed” very successfully if the right theme and tourism feature is selected for development with a specific amenity focus to separate it from the generic pack of urban development found in virtually any common city these days, and to capitalize on a novelty element that enhances Miner Avenue’s historical nature in a dramatic fashion and with high intensity that can generate for Stockton repeat visitations, travelers, shoppers, new urban residents, and so on. This is a good start, the rest will eventually come. A really savvy property investor would be buying up those vacant lots about right now. Downtown Stockton Alliance is always looking forward to any viable efforts improving our downtown. This is the historic heart and the government seat of Stockton after all. DSA has also contributed to the beautification of Weber Avenue recently, although on a much smaller scale. In an effort to “Light Up Downtown Stockton,” DSA purchased and installed hundreds of LED lights for the trees along Weber Avenue. We would like the community to get involved and help us finance lighting up additional trees along this important downtown artery. We will appreciate your help with publicizing this project. Youtube video: http://www.youtube.com/watch?v=3me0YSLYhwE, Donation center: https://downtownstockton.org/downtown_stockton_alliance_payment.php.